Our goal is to develop sensitive detection system to monitor very small concentrations of biological contaminants in drinking water. In order to enhance the detection limit of such system, concentration of the sample prior to the detection is required, for instance by evaporation. Recently we have reported the evaporation device capable of efficient evaporation of chemical compounds. However, when the monitoring of bacteria or microorganism concentrations is desired, the evaporation enhanced by temperature elevation should be avoided. Here we report a novel design, fabrication procedure and functional tests of a continuous-flow micromachined sample concentrator based on the evaporation enhanced by forced convection. In contrast to existing devices, the evaporator consists of a thin silicon nitride membrane (86.8 mm x 100 µm x 300 nm) perforated with ~86000 micromachined via-holes contacting shallow rectangular liquid channel with overlapping gas channel (Fig.1). The liquid evaporates through the grid of via-holes but it does not penetrate the gas channel, since its flux is limited by hydraulic resistance of the membrane. The evaporation rate is controlled by varying an air flow over a membrane, thus changing the efficiency of the gas layer renewal on gas-liquid interface. The concentration capability of the device depends on the efficiency of the liquid evaporation. 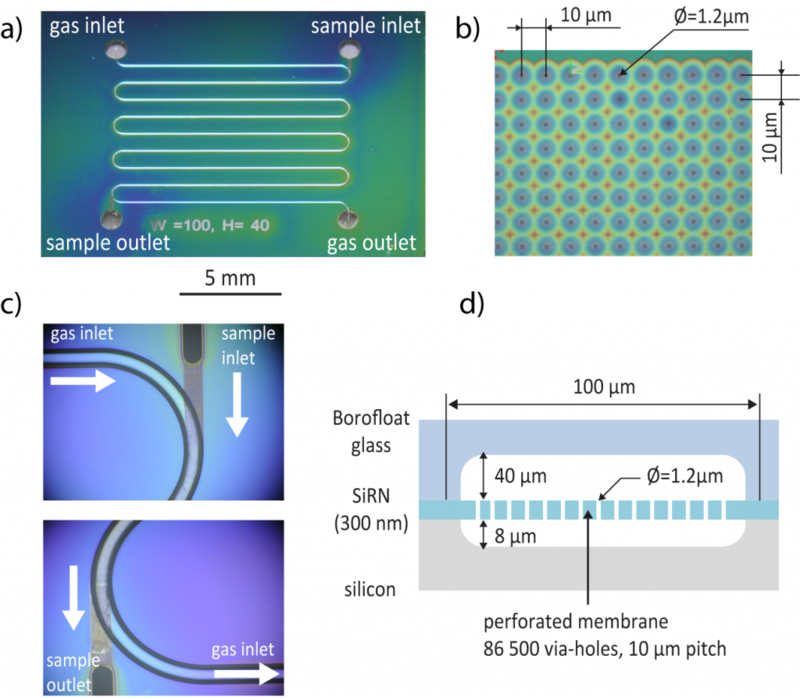 The buried liquid channel of the silicon-glass concentrator was formed on the top of the silicon wafer through patterned layer of silicon nitride (300 nm) by dry isotropic XeF2 etching. The SiRN membrane was released by under-etching. The via-holes were etched by deep reactive ion etching (BOSCH process) using a mask of SiRN. The silicon wafer was anodically bonded to Borofloat glass and diced into separate chips (20 mm x 15 mm). The evaporation tests were performed for different solvents at various temperatures (Fig.2a). The efficiency of the concentration was evaluated by comparing the concentration of marker solution pumped to the chip and collected at the outlet capillary by UV-Vis spectrometry (Fig.2b). The sample enrichment up to 50% was achieved in the temperature range compatible with biological samples (<37°C). Moreover, the increase of the efficiency caused by convection was higher than the increase induced by additional temperature elevation by 20°C within the studied borders.